200-202 Clinton St. N. Y. 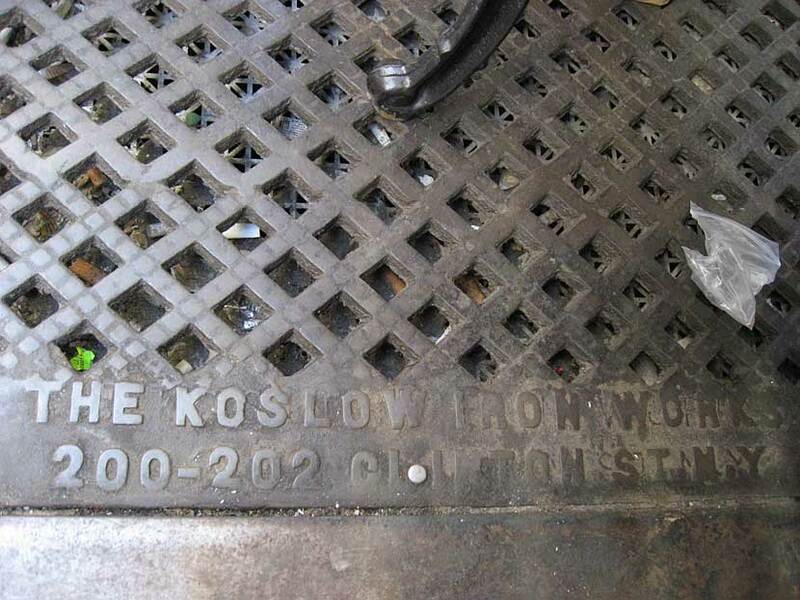 The Koslow Iron Works were located at 200-202 Clinton St. from 1912 to 1915. Proprietor was Hyman Koslowitzky (1885?-1943). Hyman Koslowitzky registered for the World War I draft in 1918 when he was employed as an iron worker at Kingsbridge Iron Works, 405 E. 99th St. At that time he was 34 years old, born 15 March 1883, an immigrant alien from Russia. He also registered for the World War II draft in 1942 when he was 57 years old, born 15 April 1885, Russia. In 1942 Koslowitzky was employed at Willis Iron Works, 951 Edgewater Road, the Bronx. Hyman Koslowitzky was the son of an iron worker, Isaac Koslowitzky, also an immigrant from Russia. Isaac (called Isadore) Koslowitzky lived at 214 Madison St., Manhattan, at the time of the 1900 U. S. Census. The family included Louis, age 18, born Sept. 1881, and Hyman, age 16, born Nov. 1883. According to the census Louis and Hyman Koslowitzky immigrated three years earlier, in 1897. The uncertainty over Hyman Koslowitzky's birth date is not likely to be resolved. His grave marker in Silver Lake Cemetery, Staten Island, NY, reads "Died Mar 26, 1943, age 57 years." This indicates the birth year was probably 1885. 1905 Koslowitzky & Lobenzky, 82 Jefferson St.
1906 H. Koslowitzky Iron Works, 82 Jefferson St.
1911 H. Koslowitzky Iron Works, 442 E. 121st St.
1911 Koslowitzky & Silverson Iron Works, 343 E. 99th St.
1912 Louis Koslowitzky & Co., 343 E. 99th St.
1912 Koslow Iron Works, 200 Clinton St.
1913 King's Iron Works, 345 E. 99th St.
1917 Kingsbridge Iron Works, 405 E. 99th St.
1933 Kay Iron Works, 1211 Wyatt St. Both Koslowitzky brothers were involved in the Kingsbridge Iron Works, who were in business from 1917 to 1928. This foundry was located originally on East 99th St. in Manhattan, then moved in 1922 to the corner of Fowler Ave. and Van Nest Ave. in the Bronx. 21 July 1921 the New York Times reported, "The Kingsbridge Iron Works purchased from the Concourse Improvement Company fourteen lots of the old Morris Park racetrack, near Fowler Avenue, including the clubhouse, held at $50,000. The purchasers will remodel the clubhouse for the manufacture of ornamental iron." The Kingsbridge Iron Works were located here (1701 Fowler Ave.) from 1922 to 1926. At the time of the 1930 U. S. Census both Herman and Louis Koslowitzky lived on Holland Ave., the Bronx. Herman, at 2920 Holland Ave., was 46 years old, born Russia, immigrated 1896, "Iron Worker." Louis, at 2926 Holland Ave., was 45 years old, born Russia, immigrated 1900, "Contractor, Buildings." Nearby, at 2910 Holland Ave., lived Sam Lozanov (1881-?). Sam Lozanov registered for the World War I draft in 1918 when he was 37 years old, born 8 July 1881, "Iron Worker, Kingsbridge Iron Works, 405 East 99th St., NY." Polk's New York City Directory listed Sam Lozanov as president of the Kingsbridge Iron Works from 1920 through 1925. This ad for King's Iron Works on E. 99th St. dates from 1915.